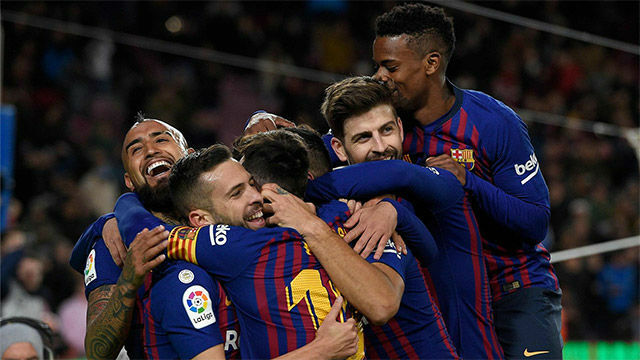 Barca players reactions after magnificent 6-1 win over Sevilla in Copa del Rey quarter-final. "They said we were going to throw the Copa del Rey and that we didn't want to win it," Messi said. "Maybe people misinterpreted my message at the beginning of the season [about wanting to win the Champions League]. We want to fight for the treble. It's our obligation to fight for all three competitions. At Barcelona, we want to win everything." The Barça No10 made one, scored one and won a penalty, which he allowed Philippe Coutinho to take. "Coutinho had scored a penalty Aagainst Levante and he wanted to take it," he added. "We talked about it. So he took it and I am happy because the comeback started there. "Cillessen made two key saves, if Banega scored the penalty or Cillessen didn't save the other chance, it would have been a different game. I'm happy for him, he had a brilliant match. And it's great to get through. "We knew that we had to turn around a difficult result. Not scoring in the first leg meant that we knew if they scored, we needed four. We played a complete game." It was a special, unforgettable night," he said. "The truth is I needed a game like this, I'm really happy [with my performance]. I've been trying everything in every game. "Things have not been coming off but I have never stopped working hard and thanks to God things went for me tonight." Coutinho's first goal came from the penalty spot after Lionel Messi handed him the chance to score from 12 yards. "The gesture from Messi shows how great he is," he added. "It was all really natural, nothing special had been prepared before the game. I'm grateful to him for letting me take the penalty." Awesome quotes, all of them. Messi "At Barcelona, we want to win everything."